Oklahoma State University's Veterinary Medical Hospital offers a host of services from wellness exams for walk-in patients to specialty care cases referred by veterinarians in the field. Clients come from near and far, many from out of state in search of care for their beloved pets, performance athletes or valued livestock. The hospital is home to 23 board-certified veterinary specialists in anesthesia and analgesia, cardiology, diagnostic imaging, ophthalmology, small- and large-animal internal medicine, small-animal surgery, acupuncture, canine rehabilitation, theriogenology/reproduction, food-animal medicine and surgery, equine surgery, and equine sports medicine and rehabilitation. In addition to a highly trained veterinary specialist, each patient may be assigned a resident, an intern and a fourth-year veterinary student, along with registered veterinary technicians and veterinary assistants. Animals have an entire team caring for them. Elizabeth Paszkiewicz of Tulsa, Oklahoma, has been bringing her animals to OSU for more than two decades. "A while back, 20 years ago or so, I needed to find some help for my horse Simon. He had a fungus so terrible that the vet at our barn didn't know how to deal with it," Paszkiewicz says. "His skin was falling off and leaving bare, oozing patches all over him. I sent the large animal clinic some pictures and subsequently brought Simon to Stillwater. The medication they prescribed was easy, and it worked." More recently, Paszkiewicz has been bringing her pug, Baby, to OSU's hospital. "When I look for a second opinion, the expertise-based reputation is everything," she says. "I feel lucky that a place like OSU's hospital is within an easy driving distance." Baby has been referred to OSU several times. She had gall bladder surgery, an eyelid tumor, a benign mammary mass removed and a fractured elbow. "I've been with the same vet clinic in Tulsa since I got my first dog in 1986," Paszkiewicz says. "They are doing everything right, but it does not mean that I do not need a second opinion now and then. Nice thing about my vets here is that they are not defensive about it, and they are always interested in the hospital's opinion." Dr. Margi Gilmour, veterinary ophthalmologist, has been treating Baby since March 2010 when she first came in for an eyelid tumor. "I've seen her every six months or so ever since," Gilmour says. "We are watching to be sure her corneas stay healthy." A recent visit to Gilmour led Paszkiewicz to give $5,000 to upgrade the ophthalmology suite. "I was thinking about making a donation to the hospital, but it always looked like something involving a lot of effort just to figure out the steps," Paszkiewicz says. "I spotted a flier in Dr. Gilmour's office, talked to her and followed the easy instructions. I just jumped on the opportunity. I think that a lot of people are like me – busy with their lives with not much time to spare but ready to contribute to a worthy cause when given the opportunity." Kim Devoll of Enid, Oklahoma, has also supported the hospital. She has four Cavaliers and one English setter. One of her Cavaliers, Isabella, is a regular patient. They were referred by their veterinarian to see a board-certified veterinary cardiologist at the hospital. OSU's Dr. Ryan Baumwart is the only one in Oklahoma. Since then, Isabella has also seen Dr. Andrew Hanzlicek, a small-animal internal medicine specialist at the hospital. "Isabella has superficial necrolytic dermatitis, also known as hepatocutaneous syndrome," Hanzlicek explains. "It's a rare disease. We see less than 10 cases a year, and primary care veterinarians will likely go years without seeing a case." "At one point, we were driving from Enid to Stillwater every week and spending six to seven hours here. Now we come twice a month," Devoll says. "I'm sorry my dog has this disease, but I'm glad for the students going through now that they get to experience it. Out of the 80-some students in the class of 2016, I think we saw 25 percent during the course of Isabella's treatment. "We have used their facilities, used their equipment. Our animals are our children now. We were happy to support the purchase of a new ultrasound machine for the hospital. If new equipment helps them diagnose a disease earlier, they can treat it earlier. We are all for helping them get newer, faster equipment. That is why we donate." 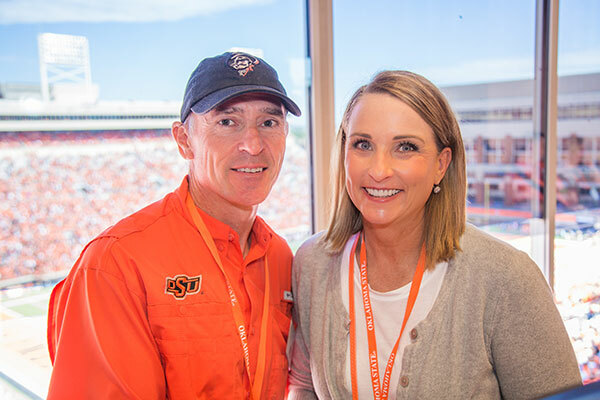 OSU alumnus Peter Erdoes and his wife Kimberly are grateful clients of the OSU Veterinary Medical Hospital. Peter Erdoes of Edmond, Oklahoma, is another grateful client. He has brought his dogs to OSU's Veterinary Medical Hospital on several occasions. "I look for honesty and integrity in a veterinary referral hospital," Erdoes says. "They have the best interest of my dog. As it is with every patient, a fourth-year veterinary student is assigned to your case to see to your dog's care. They take them outside for fresh air and were kind enough to call to tell me how my dog was doing. These people truly care about our animals and also take pride in their profession. "I read about the enormous amount of debt that some students are saddled with when they graduate, and I hope my donations will make it a little easier. It goes toward equipment, and that helps them in their journey to do what they love." Over the years, Erdoes has donated money toward equipment upgrades in the small-animal clinic at the hospital, including covering the cost of several climate-controlled oxygen cages, many IV fluid pumps and cardiac telemetry equipment in the Kirkpatrick Foundation Small Animal Critical Care Unit. The CCU was completely renovated in 2009 with a lead gift from the Kirkpatrick Foundation and donations from 76 grateful clients. "This hospital was built in the late 1970s, and many areas need upgrades or renovations," says Dr. Mark Neer, hospital director. "We really appreciate grateful clients like Elizabeth, Kim and Peter who help us make it feasible to continuously provide the best care possible for their four-legged family members." The primary mission of the Oklahoma State University Veterinary Medical Hospital is training tomorrow's veterinarians and helping to identify zoonotic and emerging infectious diseases. For the 2017 fiscal year, the hospital budget is $6,996,790. State appropriations are $1,396,790, accounting for 20 percent of the budget. The remainder of the budget is composed of a projected $5,600,000 in self-generated revenues. More than 80 percent of the hospital budget must be funded through self-generated revenues from the treatment of patients presented to the hospital. During the 2016 fiscal year, the hospital treated 15,006 cases: 10,562 small animal, 2,017 food animal, 1,863 equine and 564 exotic animals. If you woud like to share your passion for animal well-being, contact Heidi Griswold at hgriswold@osugiving.com or (405) 385-5656.